I've been making some Easter cards that better make it into the mail soon, otherwise they're not going to get to their intended recipients before the ears are bitten off the chocolate bunnies! And because I'm in a hop this weekend (April Showers Bring May Flowers), I'll be all about flowers over the holiday -- so I'll group together a couple of cards here that I thought I'd post separately. 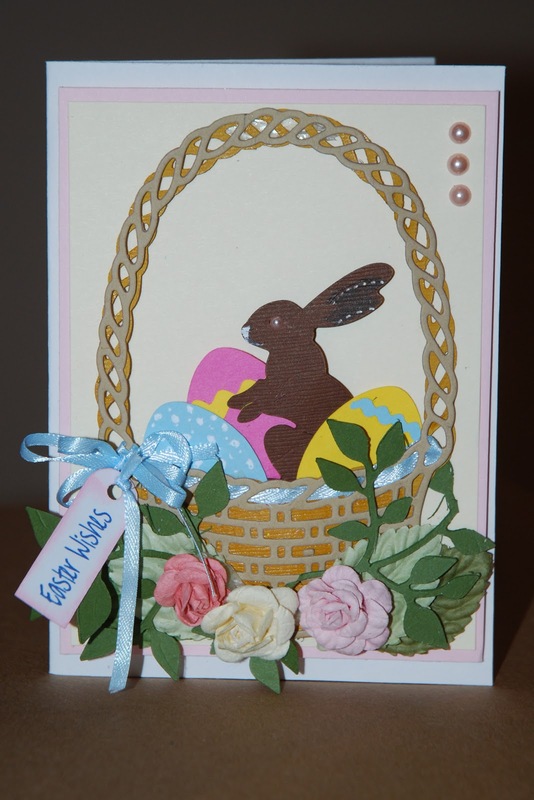 First up is this sweet Easter basket in a garden. The basket was cut using a Cheery Lynn Designs die that I purchased from Happy Scrappy. This vendor discounts Cheery Lynn dies and the owner, Alex, has generously sponsored some of my blog hops in the past. If you buy from him, please tell him CardMonkey sent you! To make the deep, double-toned basket, I cut one basket fully through, using kraft tan paper. Then for the underside, I used a mustard color paper, and under-cut the basket portion -- in other words, I only shimmed the handle so that it cut all the way through for more of a woven effect. I wanted to leave the little pieces of the basket intact. At the top of the basket, I wove some 1/8" light blue ribbon, tying it at a bow on the left side. From the bow, I die cut a Cuttlebug "mini tag" in pink and inked it using darker pink, and stamped the "mini-message" (a Stamping Up stamp) to the tag before tying the tag onto the bow. The chocolate bunny is part of the same Easter basket set... I just cut it in the color of cocoa, highlighted the ears and nose with white gel pen dots, and adhered a tiny pearl for an eye. The eggs are cut using Cricut's Easter 2010 cartridge. The leaves below the basket are cut with Cheery Lynn Designs' "Flourish" die, and the bigger leaves and flowers are from the Prima Flowers 2012 collection. I double-mounted the cuts on cream and pink, then onto my card. For a finishing touch, I added three sweet pearls that I colored (using Copics) ice pink. Next, let me show you a sweet card I made for my neighbor, Sally. 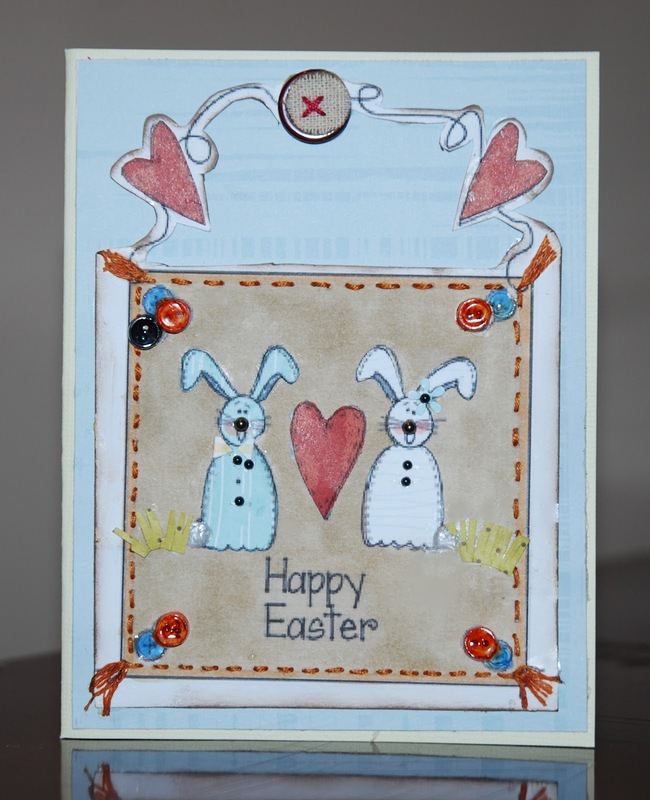 Sally's home is decorated in primitive country, so I wanted to make a card that would suit her decorating style. I think this design accomplishes that. I colored the background of the image using Copic markers. I intentionally "mottled" the ink a bit, to give it a more rustic or aged tea-bag look. 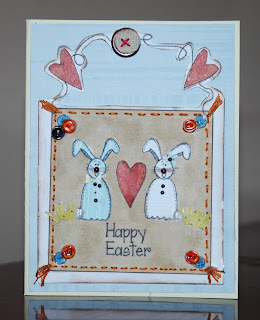 The bunnies and hearts were paper pieced using Nikki Sivils Scrapbooker papers. I added seed pearls to the nose and buttons on the bunnies -- and as I'm typing this, I noticed that on the boy bunny on the left, the button #2 has shifted in time for the photograph. Forgive me, I'll fix it before giving this to Sally!! Fabulous cards. Love the lil bunnies and the details with the stitching.